In the past, most eye doctors needed to describe the health findings inside an eye with precise words and sketches. Now, digital imaging provides an exact picture of the internal retina. Besides providing a picture that’s "worth a thousand words", this record can be kept to compare back to in the future and via the Internet, can be communicated by email to other practitioners – specialists here or in a new community if you move. With ocular diseases like diabetic retinopathy and macular degeneration, the value of this technology cannot be underestimated. From a preventive care perspective, our doctors are convinced that imaging is fabulous value. If for nothing else, the picture doesn’t wink or blink or water, so diagnosis is enhanced! 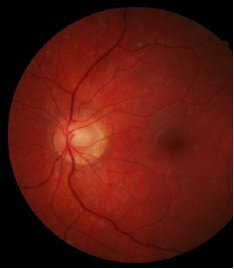 We now also offer an ability to "see" inside the retina and assess the anatomical structure and normalcy of the tissue, particularly that of the optic nerve/retinal nerve fibre layer and the macula with OCT (optical coherence tomography). Diagnoses of maculopathies, glaucoma and other pathologies can be made more accurately and timely to allow formation of a smooth management or referral plan. Digital retinal imaging and Optical coherence tomography are invaluable in helping optometrists diagnose, monitor, treat and manage everyone’s internal ocular health. Absolutely! After Jim, Beth, Alyssa, or, Solange determine what is best for the vision, it is only logical that they provide the entire treatment system – successful adaptation becomes more likely that way. If there are problems, they’ll know the reasoning behind their original decisions and will be better able to modify things appropriately. Many stores and suppliers offer lenses and frames, but beyond the outward appearance, it is difficult for most people to differentiate between the lens characteristics. With lenses, tints and, coatings, things are not always what they seem. A large range of quality exists and one promise Bayview optometrists make is that they won’t compromise quality for profit. Yes, there will be profit from providing treatment but the fees for this service will be well worth the investment. Just ask. It may be a good idea.